Summary from goodreads: "As a little girl, Daisy Appleby was killed in a school bus crash. Moments after the accident, she was brought back to life. A secret government agency has developed a drug called Revive that can bring people back from the dead, and Daisy Appleby, a test subject, has been Revived five times in fifteen years. Daisy takes extraordinary risks, knowing that she can beat death, but each new death also means a new name, a new city, and a new life. When she meets Matt McKean, Daisy begins to question the moral implications of Revive, and as she discovers the agency’s true goals, she realizes she’s at the center of something much larger—and more sinister—than she ever imagined." Due to this AMAZING description, I eagerly devoured Revived in just a few hours. What I didn't know was what an emotional roller coaster I was in for -- not emotions within the book/plot, but my feelings towards the book overall. Basically the entire first half of this book annoyed me to no end. It's very rare that I stray from the historical fiction genre, so it's no surprise that the slew of modern brands, stores, and TV shows were a bit weird to me. However, I think the constant inundation of mentions of TOMS, etsy, Target, and Arcade Fire would annoy ANYONE. It felt like you were talking to that one irksome person who always name-drops all of the "cool" and important people he knows. Also, from the book's description, I was expecting Daisy to be some daredevil who skydived and went bull-riding for fun........no. Not in the slightest. She stays in her room and does...well, not much else. Her previous deaths were all mostly accidents. Where were all of these "extraordinary risks?" Luckily, after about the first 150 pages, the plot picked up tremendously. Questions and suspicions arise as Daisy's identity and future are in balance. Daisy experiences a real death with no ability to use Revive and bring them back. Towards the book's climatic ending, I'll admit that I became nervous and my palms sweated a bit -- a 180 degree turn from how I felt towards the beginning of the book! Get through the less-than-exciting beginning and the ending/twist will blow you away. Overall, I think that the characters and their relationships were my favorite part. Daisy was sweet and likable. It was interesting to hear about her past and her memories of death, dying, and the consequences. I loved her relationship with Matt, it was a great picture of young love! It's a bumpy road with happiness, laughter, and fights. I did question her decision to tell him her secrets so quickly, however -- secrets that could be deadly for both of them. Her friendship with Audrey was abrupt but cute to read about. I loved Daisy's little makeshift family as well. These elements all made it relatable and enjoyable. I'd rate Revived anywhere between 3.5 and 4 stars! It's a sad fact, but the truth is, I have absolutely NO more space for books. This may be unlucky for me, but not for you guys! I'm giving away my copy of Revived to one of you! Just fill out a form HERE to enter! US residents only please. I'm hoping to get to this one (the cover keeps calling my name). Thanks for the heads up that it's a slow start, but worth it in the end. This sounds amazing, I'll be waiting eagerly for it to hit South African bookshelves. Why haven't I heard of this before? I am always on the look-out for books that sound good. 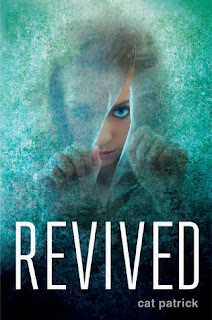 I would love to read Revived. The cover is great! Thanks for the giveaway! I've been dying to read this book so I've got my fingers crossed! Thanks for the review and the giveaway! Brand naming drives me crazy too. Beastly was that way talking about Myspace all the time and Myspace hasn't been popular in a few years. I still want to read it though,the description sounds really great! I didn't even know she had another book out until I saw it at the bookstore, and I pick it up from the library tomorrow! I can't wait! This one looks so good. I'm sorry to hear that the beginning was slow, but glad to hear that the end was awesome! I'm looking forward to reading this one. I have this one in my TBR pile, but I've been putting it off after hearing mixed reviews. The start sounds like a bit of a worry, but I'm glad to hear that it picks up towards the end. Hm after reading your review I kind of want to pick up this book. Thanks for the warning about the first half! I don't think I could stick through that without knowing that it got better.